I heard that there were more than 100 new products offered and promoted through press releases at this year’s NADA—almost double the number from last year. Among them, there were multiple companies offering a variety of solutions you could categorize as part of “digital retailing,” which is intended to help dealers engage and transact more effectively and efficiently online with sales and service customers. On this front, I asked dealers two questions. How many customers have asked you to offer more digital retailing tools? And, how many deals have you lost because you haven’t offered them? I mostly got goose eggs for answers. For their part, dealers don’t appear to be hearing a palpable hue and cry from customers for digital retailing. The absence begs another question: Why are there so many of these tools on the market? The answer, I believe, rests in the reality of today’s retailing environment. Dealer margins are more compressed than ever and there’s a growing need for them to find ways to conduct their businesses in a more cost- and time-efficient manner to make money. Further, there’s proof from dealers who are making digital retailing a priority that it actually works once their customers know about it. From my vantage point, these dynamics suggest we’re in the early stages of an evolution that will gain momentum, for consumers and dealers, in the months ahead. It’s a little like the early days of Amazon and Google, where consumers weren’t demanding a different way to purchase products or use the Internet. But there was an understanding that these businesses, and the technologies employed, offered something consumers would appreciate and eventually expect. At NADA, the sheer volume of new technology offerings left some dealers feeling a bit overwhelmed by the variety of choices, and concerned that even if they made the investment, they’d have trouble getting their managers and teams to buy in. These are important and legitimate concerns that I view as a call for solutions providers, including Cox Automotive, to deliver the implementation guidance and help that will be necessary for mutual, sustained success. In many ways, I think we’ve entered an era where if vendors aren’t giving more, they’ll be getting less. I think it’s also worth noting here that as the digital retailing evolution occurs, OEMs will also need to re-think their relationships with their dealer partners. Several dealers shared concerns that OEM mandates for specific tools and processes are making it more complicated and difficult to fashion a digital retailing strategy that they believe is the right fit for their customers and stores. 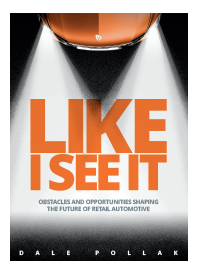 As the pace of change and need for new technologies continues, it seems wise that all the retail automotive stakeholders to remember that when you strive to do the right thing, good things happen. It was great to see so many friends, and make new ones, at NADA this year. My feet are telling me it’s time to head home. Next post: Margin Compression Takes A Bite—How Will You Bite Back?